My third grade class participates in a South Carolina State-Wide Flat Stanley Project. I read Flat Stanley by Jeff Brown to my class. Students made their own Flat Stanleys to send to other third grade classes in South Carolina. The Flat Stanleys took with them historical information about our town/community that the students had learned through research. While visiting the other third grade classes, the Flat Stanleys will learn about the history of the towns and communities that they visit, and when they return to our school, they will bring that information back. It's a great way for the students to learn about the history of SC. Each child wrote a letter telling about themselves, as well as, our town's history. Some wrote about famous historical figures, historical monuments and landmarks, the origins of the town, civil war battles fought here, natural disasters, etc. 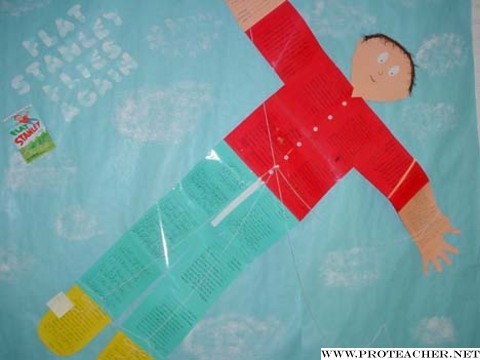 I wanted to find a unique way to display the project, so a room parent copied their letters onto different colored paper to resemble the Flat Stanley on Jeff Brown's book. His entire body, with the exception of his head, was composed of student letters. His head had brown woven string for hair and real buttons were glued onto his shirt. He was positioned in a 3-D manner as if he were a kite flying in the air. Kite string was used to emphasize this.